In 2007, my husband was approached by a New York agent looking for someone to write a book on independent Japanese music. Mason would have been a perfect candidate to write the book, but he didn’t feel ready to take on the project. So the contact languished, until I had a proposal written for a book of essays I’d edited. When I queried to Mason’s would-be agent about Morbid Curiosity Cures the Blues, I got no response. I let a month pass, then queried again. This time the agent wrote back to say he wasn’t interested, but his assistant was. She was becoming an agent herself and wanted to see my proposal. The day she agreed to represent my book was one of the happiest of my life. I became Hannah’s second client. Morbid Curiosity Cures the Blues was the second book she sold. In June 2008, it went to auction and won a five-figure advance. I thought I had it made: New York agent, book contract with Scribner. My agent was interested in representing my fiction as well as the nonfiction. We talked about my writing career. She said she was in it for the long haul. Scribner saw my book as a perennial and wanted to keep it in print. Then the economy collapsed. The day my advance check came, my bank failed. Everyone else was in line at the local branch of Great Western Bank to take their money out. I alone was depositing a check. The bank was insured, so I stood a chance of getting the money someday. If I didn’t deposit it and the bank the check was written on failed, it might be a meaningless scrap of paper. Because the subject matter of the book was dark, Scribner decided to publish the book in October 2009. I worked hard that month, talking to 17 radio hosts across the country, reading in 11 bookstores from LA to Seattle. I interviewed all the contributors to the book on my blogs. I did everything I could think of to sell books. Then the holidays came along and no one was interested in talking about dark subjects any more. Borders closed. Indie bookstores closed. My publisher decided to pulp the paperbacks, but keep the ebook in print indefinitely. I sent my agent a proposal for a completed book of cemetery travel essays. She made me revise the proposal over and over to answer the question of why anyone would want to visit cemeteries (a question it took me 332 pages to answer in the book itself). She had nibbles on the proposal, but no one would commit to the book. Over the next three years, I sent her a completed urban fantasy novel. A completed horror romance. A completed space opera. A completed collection of previously published morbid personal essays. In the end, I sent her a total of six books. She sold one. She took a proposal for another, but couldn’t find a home for it. I was crushed. I wondered if I’d ever sell another book. I spent several months so depressed I barely wrote anything. I felt like I was mourning a break-up, even though my agent never officially broke up with me. It was just that the agency she worked for had morphed from representing interesting edgy work to selling celebrity cookbooks. My work didn’t fit their mission any more. A friend I met through the Horror Writers Association asked if I had any books for his new publishing company. He bought my collection of cemetery essays. A small publisher that I met at a World Horror Convention bought the horror romance. An author I read with said he was working at an ebook publisher and asked if I had anything he could read. He bought my book of morbid personal essays. I contacted one of the guys who worked at Borderlands Bookstore, my local genre bookstore. He’d co-founded an indie science fiction publisher that had been subsumed by a New York publisher, but he was still working for them as an acquiring editor. I told him I’d written a space opera he might like. When I submitted it, I told him I had a Nanowrimo draft of a sequel to the first novel. 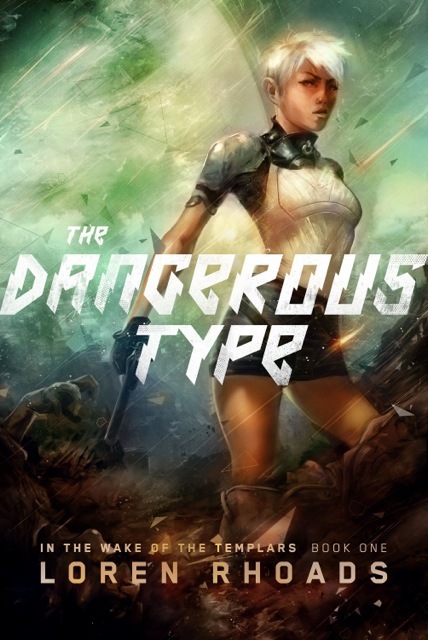 Two weeks after I submitted The Dangerous Type, Jeremy asked to see the unfinished sequel. Then he wrote to say he’d told the publisher they should offer me a three-book contract. “You can write a third book, can’t you?” he asked me, after the fact. Three years after the last rejection from my agent, I’ve had four books published. They include Wish You Were Here: Adventures in Cemetery Travel (Western Legends Publishing), As Above, So Below (Black Bed Sheets Books), The Haunted Mansion Project: Year Two (Damnation Books), and All You Need is Morbid (Wattpad). Getting all those books into print helped secure the contract for the trilogy that will be coming out over the next five months. Three years ago, I was so close to giving up writing. The goal of my life had been to sell a book to a big New York publisher. I thought that having an agent who was as committed to my career as I was meant that I had it made. And then everything fell apart. The seven books I’ve sold since leaving the agency haven’t netted me anything near the five-figure advance my agent scored for me, even cumulatively. That big advance almost ended my writing career: my book didn’t earn out its advance and that made me a bad risk for any other big publisher. If I hadn’t gotten greedy, egged on by my agent’s enthusiasm, I could have made a smaller New York publisher very happy. Instead, I had to get out of Dodge. Each book I’ve sold on my own has been a step on the ladder back to the career I’ve always wanted. Money is great, but what I really want is for people to read my books. Every kind email from a reader, every glowing comment on Facebook, every great review makes the sacrifices worth it. This past year has been rough. Even though I signed the contract with Skyhorse for the space opera trilogy in February 2014, I didn’t get the editor’s notes on the first book until mid-October. I finished the final draft of The Dangerous Type by mid-November, then dove into Kill By Numbers. I expanded it from the 50,000-word Nanowrimo draft into a complete first draft. The final draft of that book went in the first week of February. Then I turned to No More Heroes, which was nothing more than two scenes and an outline when I began. I wrote the first draft, got the editor’s notes, and turned in the polished final draft on June 8. No way could I have written and revised a 95,000-word book in five months without the training I’ve gotten writing all those earlier books, both the published and unpublished ones. When it comes out in November, No More Heroes will be my tenth published book. It’s the seventh novel I’ve written. The most important lesson I’ve learned from all of this is to never quit. The more people you meet – editors, publishers, other authors – the more opportunities will be presented to you. That’s important and useful, but if you haven’t done the work – if you haven’t written the words, haven’t learned the tricks you need to keep your body in the chair, your fingers on the keyboard, plowing forward – all the opportunities in the world won’t help you. Write the books you want to read. Do it for yourself. Luck favors the prepared.